I love Basmati rice and vegetables! I The rice is fluffy and looks like a cloud and is quick and easy to prepare! I have been searching for the perfect brand of rice! Royal International Basmati Rice is a favorite rice of mine. It is so flavorful and easy to prepare. Royal International is a wonderful brand that makes a gluten-free, non GMO, and vegan Basmati rice. The rice is harvested from an area at the foothills of the Himalayas by local Indian farmers who use pure mountain spring water and fertile soil to grow the rice! Once the rice is harvested, it’s placed in temperature controlled silos for no less than 12 months! In addition, this amazing combination produces the fluffiest tasting rice I have ever eaten! I can see why this is the number 1 selling Basmati Rice in America! Light coconut milk that is gluten-free. 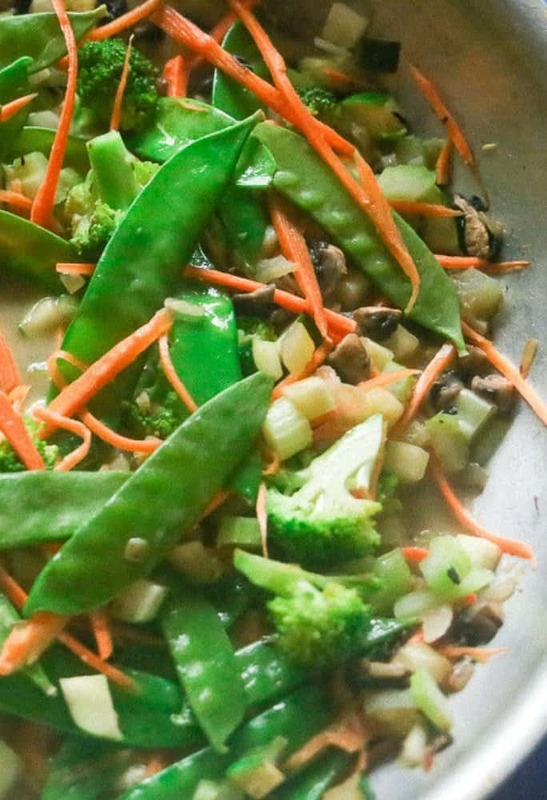 This meal provides a perfect amount of vitamins from the veggies! I love meatless meals and this is on the top of my rotation for family meals. Especially now for my family, we celebrate Easter and Lent, so we eat meatless meals a lot. 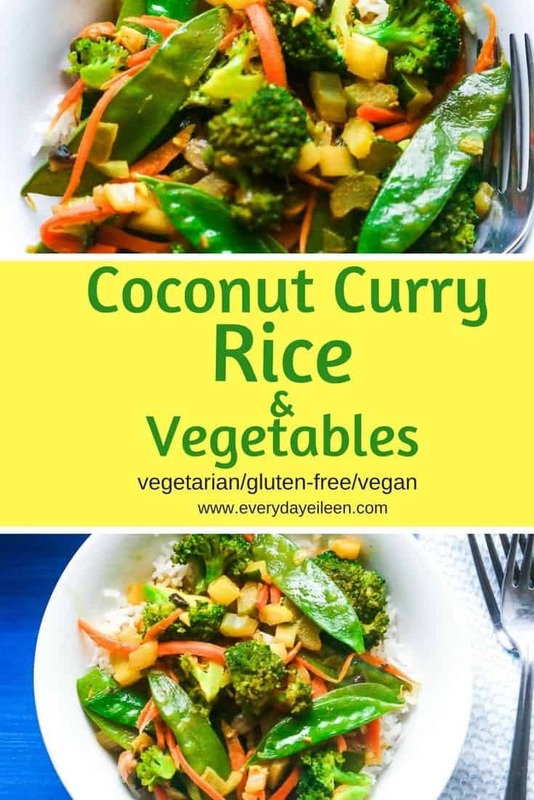 This coconut curry rice and vegetables is a favorite because I can also vary the veggies. I tend to shop by my belly and brain and I overbuy veggies all the time. This meal is awesome because it is so versatile and a great way to use up the veggies. The vegetables can be changed to please your family. I used broccoli, carrots, mushrooms, zucchini, and snow peas! Feel free to change up the veggies to what is in your fridge or your favorites. Remember to cut the veggies to proportionate sizes so they cook evenly. Tofu is always a great protein addition. Soak basmati rice in water for about 15 minutes to remove any extra starch. So while the rice soaks, I prep my veggies! Cook the basmati rice in the coconut milk while you saute your veggies. You are going to love the flavor of the rice! Saute the veggies in coconut oil until soft. 4. Add in garlic, ginger, remaining coconut milk, veggie stock, and spices. Saute until tender. It’s best to start with less spice and re-season after the veggies are sautéed. 5. 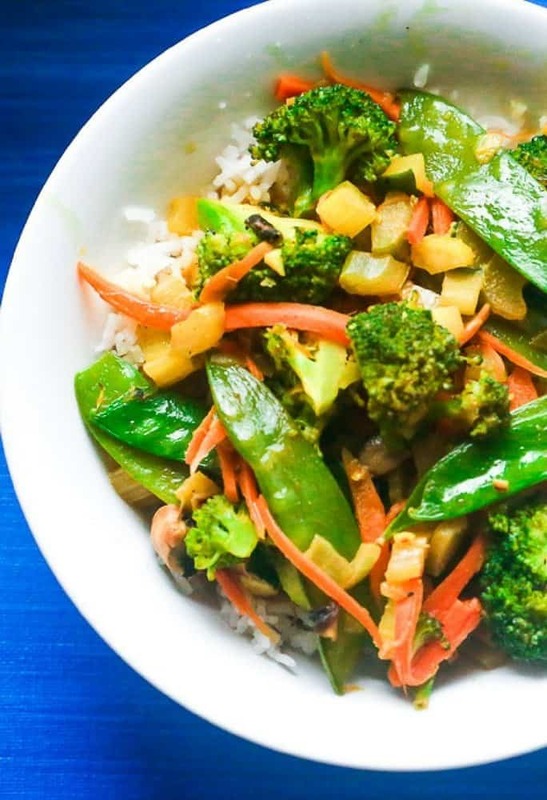 Combine the coconut rice and veggies and enjoy! I truly hope you enjoy preparing this dish as much as I do! Meander down the rice aisle at your grocery store and purchase Royal International Basmati Rice! If you are not sure the store location near you who sells this rice, check the Royal International website for store locations! ONCE YOU MAKE THIS RECIPE, I’D LOVE TO SEE IT. LEAVE ANY COMMENTS OR QUESTIONS ABOUT THE RECIPE BELOW IN COMMENTS! * Recipe originally published January/2016. Photos updated and some info in post as well, Recipe remains the same. Have you enjoyed this recipe, I hope so! Let me know and giving it a 5-star rating is always super helpful for me. 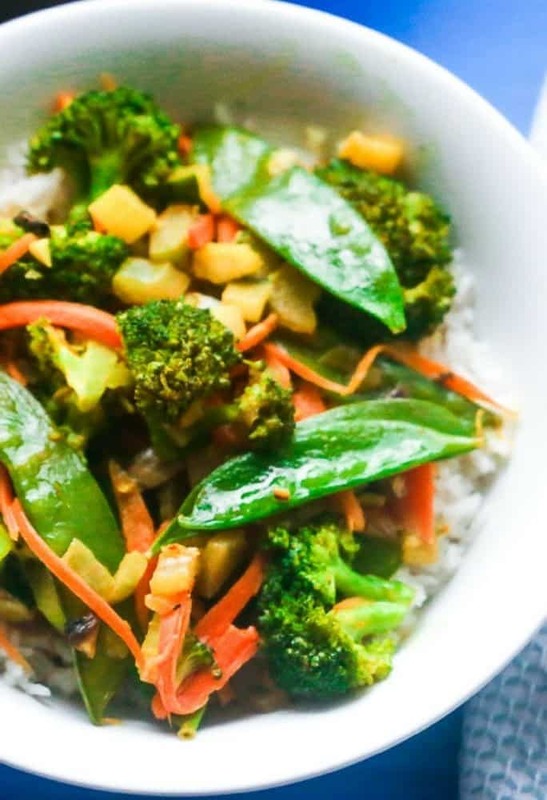 Coconut Curry Basmati Rice and vegetables is a healthy gluten-free, vegetarian meal that is delicious and full of flavor. Quick cooking and low in fat and calories. 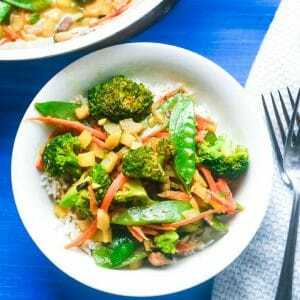 The coconut and curry add wonderful flavor to the Basmati rice and vegetables. 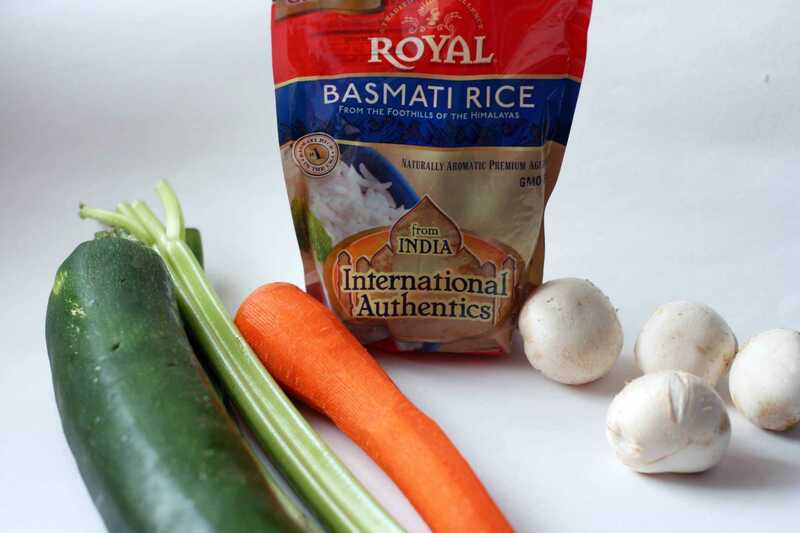 In a medium bowl, soak the Royal Basmati Rice for at least 15 minutes in water. While rice is soaking, cut the vegetables as instructed above. Once vegetables are prepared and the rice is soaked, drain the rice of the water and rinse to remove any extra starch. Into a medium saucepan, add the Basmati Rice, 1 cup of the light coconut milk, and 3/4 cup of water. Place saucepan, uncovered over high heat, bring to a boil, stirring occasionally. Let liquid reduce slightly below rice level, reduce heat and cover with a lid. Simmer for about 15-20 minutes. While rice is cooking, in a saucepan over medium heat, add the coconut oil. 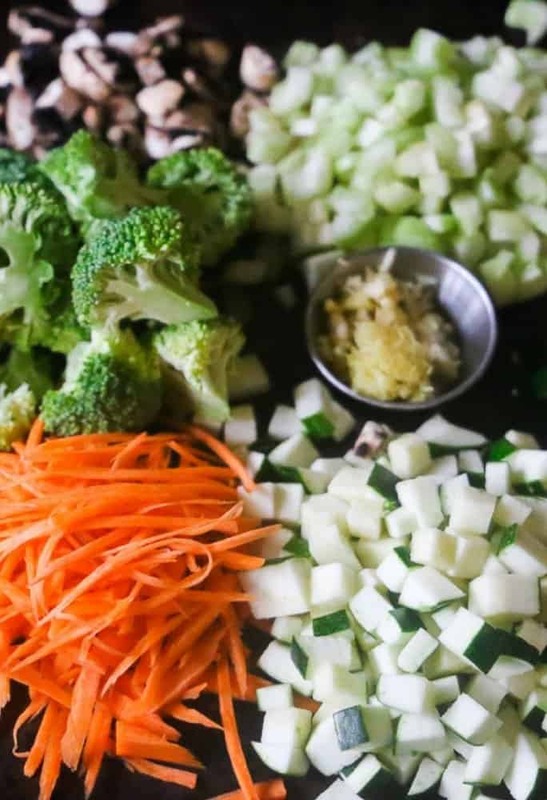 Add the minced garlic, grated ginger, chopped green onions, chopped broccoli, diced zucchini, julienne carrots, celery, and mushrooms. Saute till soft, about 5 minutes. To the saucepan, add the remaining light coconut milk from the can, vegetable stock, ground turmeric, cumin, coriander, red chili powder, and salt and pepper to taste. Let simmer for about 8 minutes. Then add in the snow peas and continue to simmer for another 3-5 minutes. Check the veggies for desired tenderness. Recheck your seasonings and adjust if needed. Adjust seasonings as necessary. Some may like more chili powder. Serve immediately and add chopped cilantro as a garnish. I love how curry brightens up the flavour of anything especially a bunch of veggies. Such a great meal for during the week to have in the fridge. It’s good to put on the weekly meal roatation! I so agree! This is one we make weekly! I love how curry brightens up the flavour of anything especially a bunch of veggies. Such a great meal for during the week to have in the fridge. This looks like a delicious family meal! I can’t wait to try your recipe! Awesome Sara, I hope you enjoy! I’m always on the lookout for delicious vegetarian dishes and this is one of them. So chock full of nutritious vegetables and the coconut adds a nice layer of flavour. Excellent! This is a great time of year for meatless meals with Lent. And this one looks so fresh and delicious! Absolutely Lynette! We love this during Lent. So easy to make on a Friday for a quick and easy meal too! 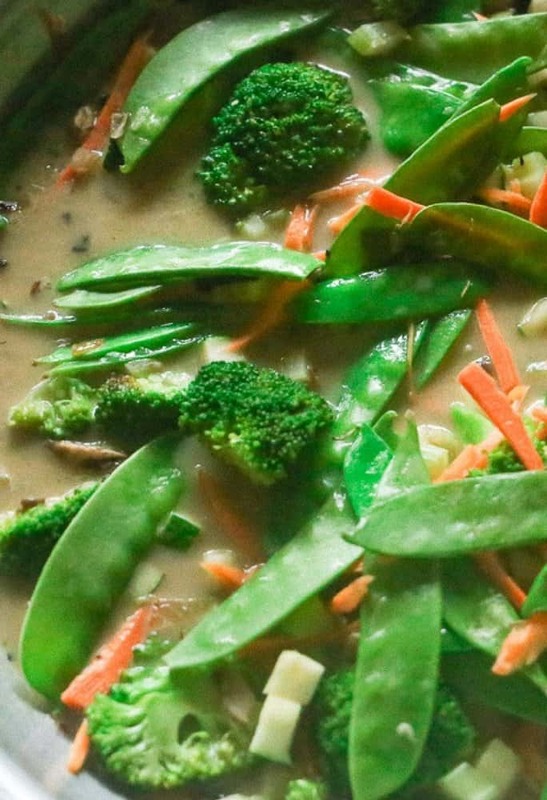 LOVING this veggie coconut curry! It’s so colorful and the flavors sound fantastic! My system can no longer handle rice (insert wail) but I will certainly be enjoying this recipe over some cauliflower rice! This looks like a perfect Meatless Monday meals! The coconut curry looks and sounds so flavorful and I just love basmati rice! Thank you Rachel. Has quickly grown in the weekly rotation of favorite meals in my house! Enjoy! 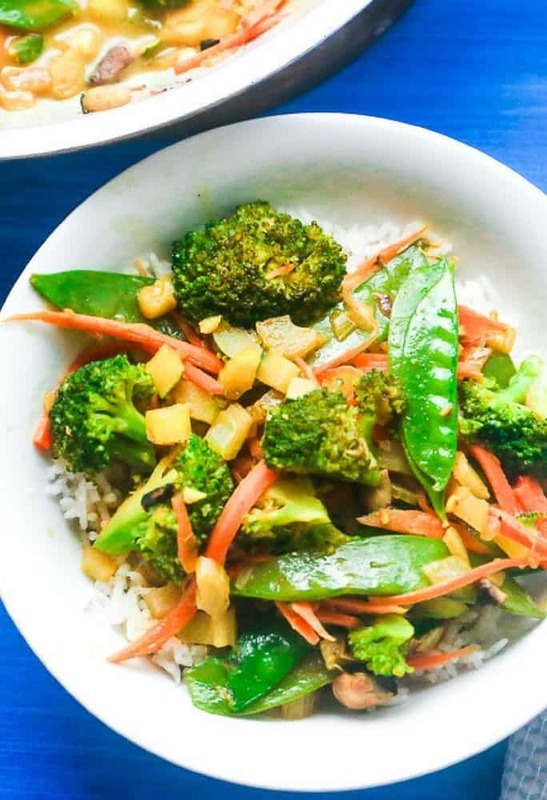 All my meals are meatless meals so this Coconut Curry Rice and Vegetables is right up my alley. It is tasty, nutritious, delicious, and that basmati rice, fantastic! Fabulous Nicoletta! I hope you enjoy as much as we do! This looks so colorful and healthy. we have cut way back on meat, and this will be a good meal to add to our vegetarian m ix. Fantastic Anne, I am happy you enjoy the recipe! We are eating so much more meatless meals and we love it! Gorgeous, light and super tasty looking! I love the colors and my mouth was watering with your photos ! Thank you so much Paige! I hope you enjoy the recipe! Oh, what a great looking dish. There really is a special place in my heart for stuff with coconut milk in it. It just brings a heartiness and fullness to a dish. Ben, I am with you! Coconut is really a friend! This dish is amazing because of the coconut flavors. My son lives on this meal. I would eat this any day of the week! I was worried there would a be a lot of unusual spices but I’m happy to say that I have everything and I will be making this over the weekend. I know exactly what you mean Denise. I love flavor and spice but I cannot go crazy.I need to know what I am eating. Glad you enjoyed the recipe. I just love coconut curry! This looks like something that would be such a huge hit a my house, I can’t wait to try it! Yaaay Madi! I am thrilled you love coconut curry too! I hope you make this for your family and enjoy! Oh, wow! We love our curry as a weeknight meal (my husband makes it), and this coconut curry rice looks and sounds incredible! Can you believe I’ve never had curry?! I need to make this and change that! You do have to change that and this is a great recipe to start with! Enjoy! I am so happy you enjoy the recipe Linda! I hope you enjoy as much as we do! This sounds like just what I need after a weekend filled with heavy food. It looks delicious! Thank you Liz, It is so tasty! This is a great meal, for the days when family members have to work late. Absolutely SachaI A quick, easy and tasty meal! This looks so yummy,, great for vegetarians 🙂 My friend will love it! This looks good. Rice is one of my favorite foods. My kids get tired of it sometimes. Me too! An affordable easy meal! I would not say no to this recipe..gosh..it looks so delicious! Put some chile sauce with this dish..mmm… I wont complain any bit! I really like your recipes. Thank you so much! I love the idea of an addition of chile sauce, delicious! This seems like a great and easy recipe! I also love how much detail the company puts into making their rice. Yes, me too! And it comes out in great tasting rice! Basmati rice is my favorite. I make it at least once a week. It goes so well with everything. I will have to try this recipe on the weekend. I love the combination of coconut and curry, the outcome is always awesome! This looks really good. Never had curry. I love coconut rice–I make it as a side dish regularly, whether we’re eating Indian or not. And I actually don’t mind sticky rice (especially when I’m making sushi or sushi bowls), the different textures can be fun to play with. This is really good and tasty! I love curry rice and vegetable, I wanna grab it now lol. I know, I had some for lunch today! Hit the spot! This looks yummy and healthy! Might have to try this recipe out this week. That sounds great to me! Veggies are my fave (I can hear my kids groaning as I type that, lol). I love curry, but I hardly ever cook a curry based recipe. Thanks for the inspiration. this looks yummy! I am reltively new to curry as well! I have decided 2016 every week try something out of my comfort zone! I will have to try this recipe, my family LOVES rice! My oh my, that looks yummy! I love curry and I love that this is all vegetables. It is so tasty. The sauce was incredible! That looks so yummy! I can’t wait to try this. I love rice recipes! I’ll definitely have to try this one sometime. Thanks for sharing! Yum! This looks delicious! I love coconut curry. I don’t think I have bought basmati rice in a while, I will look for this brand! You won’t be disappointed! I am happy you will be tryig this one! These days, anything with broccoli is my jam! Looks delicious! I love anything with rice, so I’m on board. yum! This is a yummo coconut curry! This looks delicious. I need to make it! This absolutely delicious. I hope you love it as much as I do! That’s an interesting combination to me. I normally don’t go for coconut, but mixing it with something spicy just might work for me! I experimented a few times before I got this tasty one! This looks really good! I don’t think the kids would enjoy it as much but I would! I hope you treat yourself and make this for yourself! I’m not above using the rice in the packets. Especially when I’m cooking for one person. It’s more expensive, but worth it to me in terms of convenience. I’ve never heard of mixing these ingredients for one dish, but it is definitely something different that I will have to try out! Its a quick and easy recipe. Hope you try it! OMG I love coconut curries… all of them. Thanks for sharing, I’m going to try this. It so Yummt. This one in particular is now my top favorite curry! This dish is something I would really love! Indian touch is always tasty! I hope you let me know how you like this one when you prepare it! Kinda new to me. Love this recipe. Might try this soon! I hope you try it. You will love the flavors! That sounds delicious. I have always wanted to try something like this. This was so tasty !Hope you make this one! Basmati rice is one of my favorites. Have you ever tried purple rice? It would be great with this recipe. This sounds amazing I love coconut rice and it is great that it caters to such a wide range of allergies too. I like the idea of using cauliflower too. Yes, cauliflower would be awesome with this recipe! Coconut goes really well with curry and rice! This is a lovely recipe. Thanks for sharing! That looks so yummy. Bonus that it is low fat. Absolutely and the coconut curry sauce is amazing! I need more curry in my life! I always order curry when I am getting take-out but just don’t make it at home enough. Can’t wait to try this! This recipe sounds delicious. I think I can almost smell it. Interesting facts about the rice. I had no idea the process of rice making took so long. Coconut curry rice sounds so delicious. I need to make this for dinner. Yup, no to the sticky. Yes to fluffy rice! Basmati rice is our family’s favorite rice. I’m the only one who likes coconut and curry though so I’d get this all to myself! It looks and sounds amazing, thanks for sharing! Lucky you, more to eat! This sounds absolutely amazing! We eat a TON of rice in our house because it is one of the only things our daughter likes! Super! Glad you like this one, enjoy! Yummy! I like sticky rice, I think I’d love this. I’d have to leave out the coconut though, I’m allergic. This looks delicious! I am a huge fan of rice and veggies! I have never tried coconut curry, but it sounds really yummy. Thank you! I hope you try it and use the Royal Basmati Rice, it is life changingly fluffy and tasty! That looks so yummy. I love coconut but have never had it in rice before. It is a layering of flavors that really taste delicious! Thank you! This is so delicious! From the rice to the sauce. A favorite!